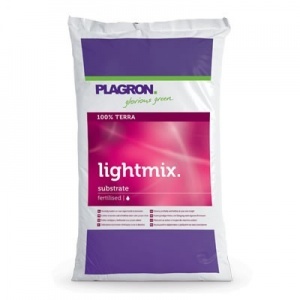 Plagron Light Mix is a lightly fertilised organic soil mixed with perlite and is ideal for use as a potting soil with young plants. We also recommend using a light mix for all soil grows as the ability to add nutrients as required gives you more control over your growing environment. Plagron is a mixture of various types of peat combined with other fibres to increase oxygen levels. There is also perlite  expanded volcanic glass  to aid water retention and prevent the soil compacting as much.